Do you have tons of wet drippy bath toys? All left in the tub? Or gathered into a plastic basket? We were placing our toys in a plastic basket with holes, so it seemed to dry out the wet toys……but let’s be real. That thing was trapping in moisture and the toys were getting moldy……..and mildew was building up all over the toys. Gross. 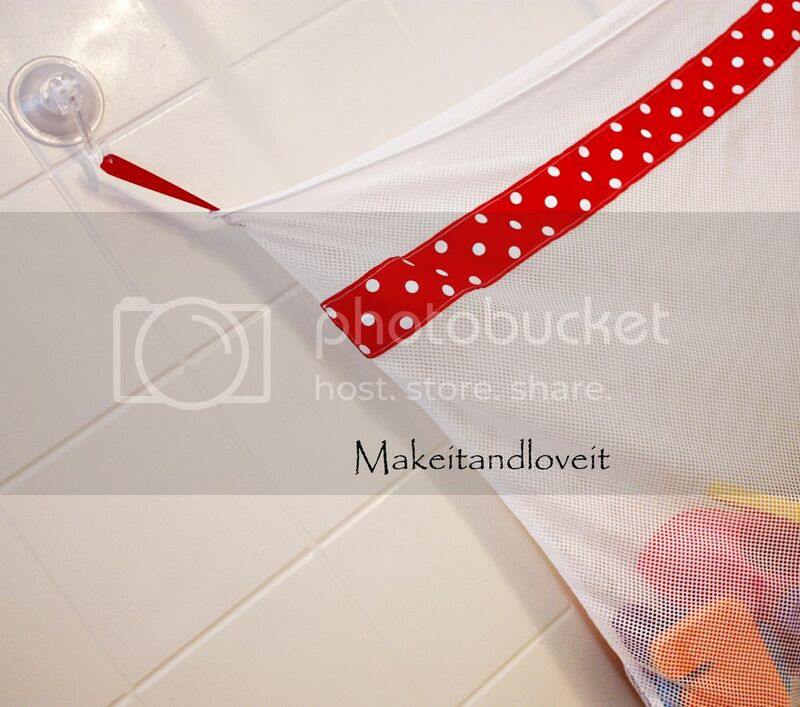 A mesh bath toy bag. The material is light and airy, with plenty of holes to allow the wetness to evaporate completely. 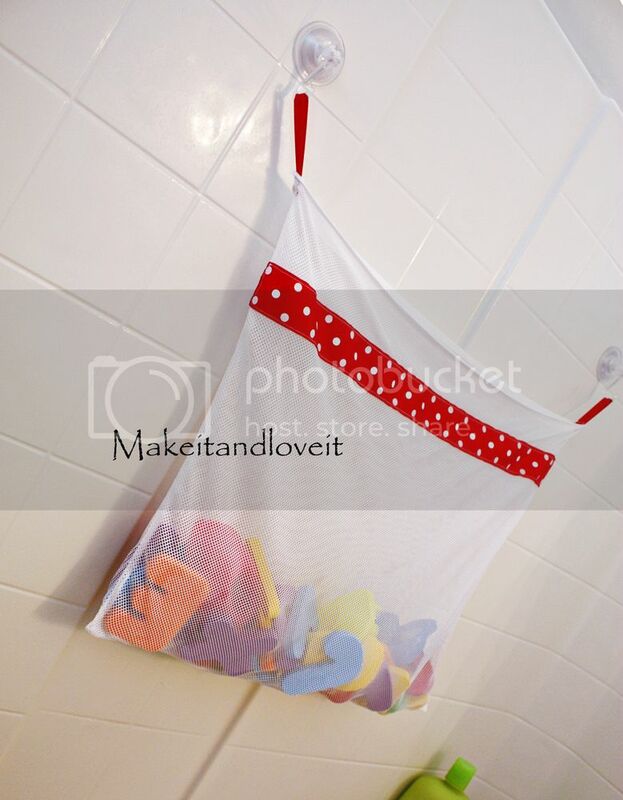 After the bath, let the kiddos fill up the bag and then hang it up to dry. I found some of this light mesh material at Hancock Fabric. I’m sure it’s available in a variety of fabric stores. I cut out 2 pieces of the mesh that were 20 x 15 inches. Along the top edge of both pieces (20 inch edge), I made sure to use the selvage (factory finished edge) of the material as my edge, so that I wouldn’t have to finish that edge myself. Then I sewed along the sides (15 inch sides) and the bottom with a 1/2 inch seam allowance. The I zig-zagged right next to it, and let the fabric roll under as I was sewing and kind of bunch up the material as I zig-zagged. This will keep that edge nice and tucked under and free from fraying later on. Then I turned it right side out and added some ribbon to the front of the mesh bag, about 2 inches from the top. I first heat sealed the ends of the ribbon (use a lighter to melt and seal the edges) and then I sewed all the way around the ribbon, to secure it to the bag. Then I cut 2 pieces of narrow ribbon, each 5 inches long. Then I folded each piece of ribbon in half and sewed them to the inside of the bag, along the side seam on both sides of the bag. Then I attached the hooks to the tub wall, hung the bag, and filled with toys. Perfect place for those wet toys to dry. Thanks, I bought one of these from Target last week and it did not work so I took it back. Now I can make my own. What a great idea. I never thought of that and I had the same problems with the toys in a plastic bin. Thanks for the inspiration! i am going to have to make this – major problem in our bath tub- i will post it on my blog and link back to you– thanks so much!! Thanks for the instructions! I use a store bought one for our bath loofahs so they get aired out. FYI, I found Large suction cups with soft plastic hooks in a 4 pack at JoAnne's for $1 and they work really well. Oh that is wonderful! We have had the same issue in our house. Great idea! Cuuuuute! Gonna have to make one of those! Great idea & so easy to make! I absolutely love this idea. I am pregnant with my first and i would love to do this for him! Thank you for sharing. This idea couldn't come at a better time for us. Our daughter has started playing with toys in the bath and I tried finding something simple for the tub. Nothing I found in the stores was what I wanted. Never once did I think to make my own. Brilliant! Thank you. I totally need one if these! Great idea and easy enough I might be able to do it! resourceful AND cute. love that! P.S. Maybe I've said this already or maybe I just think it every time I use your tutorials, but just in case I haven't said it I will now: Thank you so much for having such accurate/plain/normal titles for the posts you do with tutorials. It makes my life that much more simple when I copy and paste them into a word document to save for later and for the times when I forget to copy and paste it the first time around and come back to search it is so much easier to find! Anyway, it is a silly little thing, but it makes my heart happy every time. Thank you! Fantastic idea! I was finally out of the bath toy stage with my dudes and then her comes baby K! Thanks for sharing! I saw the $ store had these as well. wow! this is amazing timing! i just got some mesh to figure out how to make a bag for plastic dishes to hold! im in charge of girls camp at my church and we wanted them all to have bags to dry their dishes! i am going to put a drwastring on mine, but i wasnt sure if i should straight or ziz zaz stitch. now i know! Thank you! I've been looking at those bath toys for weeks thinking I really should do something about them just sitting in the tub like that…. I wasn't aware that they had some of this fabric available at the stores so I'm definitely going to go check it out. Thanks for the idea. It was almost creepy how well you described the plastic bucket at the side of my tub and the delusion I've created for myself that it works. :D Thanks for the great idea. Thanks for posting this idea. I might make one for a gift. I have a store bought mesh bag for our bathroom. In the past, I have used plastic mesh onion bags with great success. If you don't have a lot of toys, they work great and you are using something that might have gone in the trash. Fantastic idea! I'm sure everyone with little ones could use this. I often make hooded bath towels (slightly different from your pattern) and give them at baby showers. This would make a perfect compliment for the towel. Thanks. Hi I'm Monica to Milan Italy. Your bag is very pretty. will make a February 27 article on my blog on your bag. if you must come and see me. I am going crazy! I've been looking everywhere for your felt Mr. Potato head tutorial and I can't find it! Can you help me? Sorry Jeanine, I had to take it down. Hasbro contacted me and let me know that using their name and similar appearance was in violation of their copyright. I felt bad for the misunderstanding so I quickly removed it from my site. Sorry about that! I bet your could save some time by getting a mesh laundry bag at the dollar store. I have seen them there. I definitely need one of these for my son! How much weight can the suctions hold though? That's the only thing I'm worried about. Cute! I will let you know if I do one and post about it! Thanks for the info. Thank you so much! I made one this morning and my little girl is thrilled! P.S. I had enough net left over to make my daughter a veil addition to one of her crowns. Awesome! Thanks so much for sharing your brilliant ideas. I love your blog. I made another one of your projects! You're probably getting sick of me linking up my stuff, but I can't help it, it's all too cute and too fun. :) Thanks again! You can also tie the ends together and put the bag of toys in the top rack of your dishwasher to sanitize them once in awhile. Be sure to use the air dry, not the heated dry cycle on the dishwasher. Love your idea. But I was too lazy to sew my own mesh bag. The Dollar Tree sell lingerie bag 2 for a dollar. I added ribbon and a hook to it, and it works just like yours. But a lot less sewing for me to do. Thanks for the idea. Thanks for the great idea, Ashley! I’ve been meaning to make this for a while and on a recent trip to Ikea, I found a 2 pack of mesh bags for $2, so I added ribbon and used some suction cups I had around the house! So much better than the bulky toy container that kept falling off the wall! Thank yoy for the idea. After seeing this and another idea Idid something similar. I hung up another shower curtain rod on the inside of the shower and hung the toys up on some shower hooks in laundry bags like yours. This is working great. The toys are out of the drawers, off the counter, easy to get out of the way when they are still wet and not in the way while taking a shower. Love it!